The afforestation project grew from an idea that began 16 years ago, when then plant president, Seizo Okamoto, had a vision of a nature trail adjacent to the childcare center. With the help of a local landscape architect, 10,000 saplings of 17 native species were planted along a one mile loop. The program took on new life five years ago, and planting began in earnest. So far more than 90,000 trees have been planted; the final goal: 125,000 by the end of 2014. To get the trees in the ground fast, Toyota used mechanical equipment to plant most of the forest, but it also asked associates for help. Team members and their families hand planted 1,000 trees in just a few hours. Their handiwork has created new habitats for native animals, such as white-tailed deer and red-tailed hawks, to live and prosper. 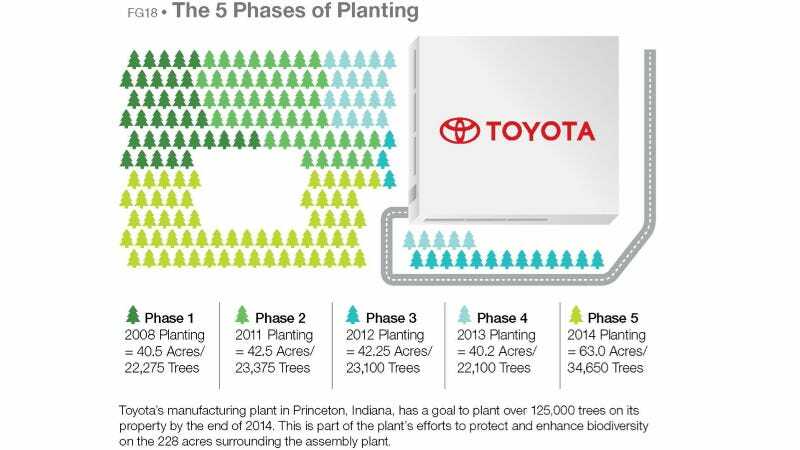 "The goal of sustainable growth that is in harmony with the environment is part of our Global Vision," says Toyota Motor Manufacturing, Indiana (TMMI) President Norm Bafunno. "TMMI is proud to support and enhance the communities where we live and work through environmental stewardship of our land, community service and environmental education programs we offer to our local school children each year." For more information about Toyota's environmental efforts, view the North American Environmental Report at http://www.toyota.com/about/environm….